Home » Comments » cookery » Featured Articles » UK » Bad Milk Makes Good Cheese! Bad Milk Makes Good Cheese! Lyn transforms a carton of bad milk into some great recipes. Eating her curds and whey…. says the famous Nursery Rhyme. I went out for the day with shopping in my boot and by the evening the milk had gone bad and separated. 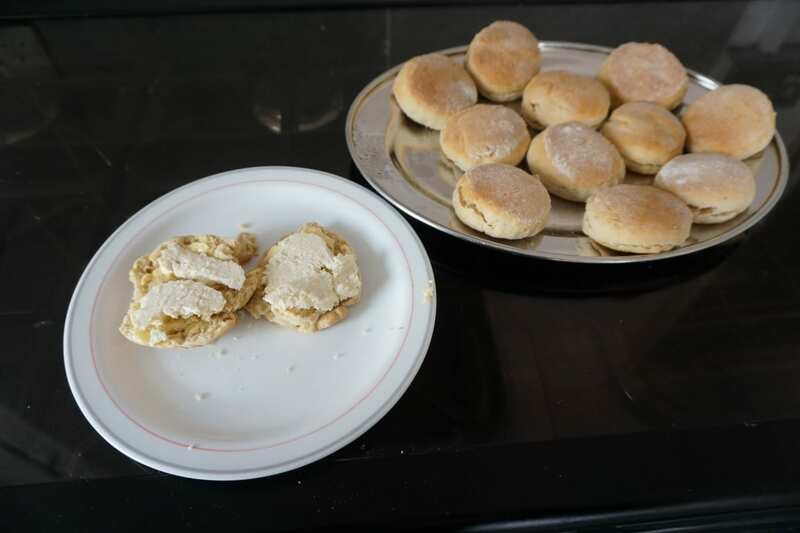 After some research I decided not to waste it and try some recipes. And oh, success! I’ll never throw bad milk away again. In fact, I’ll buy extra milk when it’s reduced in price and leave it to stand at room temperature overnight. Here’s my version of an old wartime recipe for home-made cheese. They couldn’t afford to waste anything! 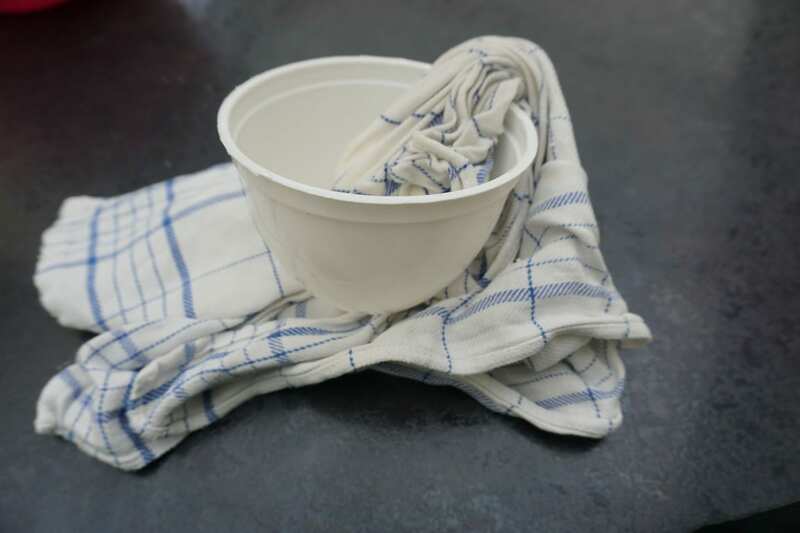 Stand a colander over a large bowl and drape a clean tea-towel across it. Pour the milk into the cloth, making sure you get all of the lumpy bits out of the carton. 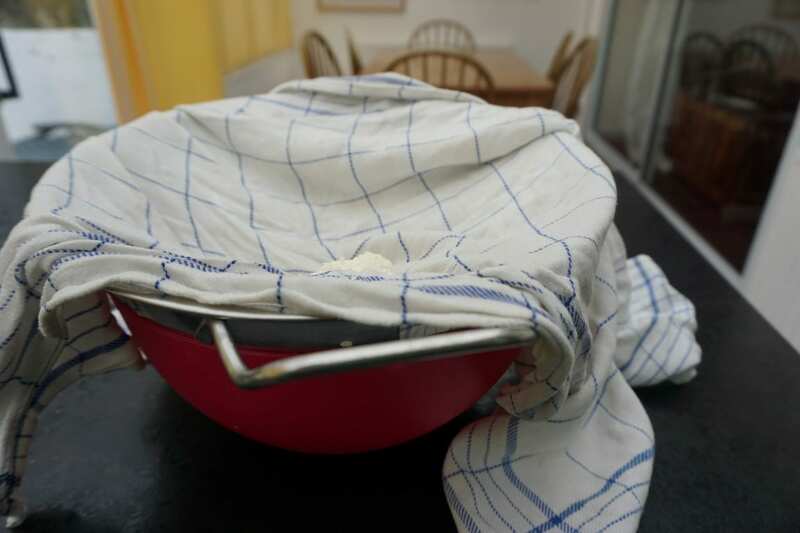 When all the liquid – the whey – has drained through the cloth into the bowl, gather the tea-towel together and gently squeeze the cheese – the curds. Open the cloth and add a sprinkle of salt to the cheese, mixing it in by hand. Gather the cloth together again, give it a twist and place it in a smaller bowl. 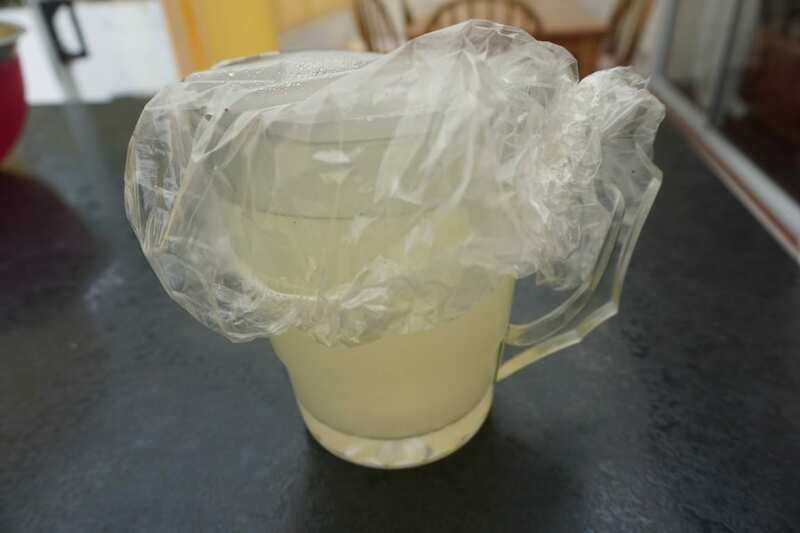 Place the bowl in the fridge, tucking the cloth under the bowl to lift the cheese off the base of the bowl. In the morning you’ll have a circle of cheese. It’s useable immediately, but I’m going to let mine keep for a while. And it’s going in a flan. It tastes like mozzarella. It’s quite hard and rubbery. It would be lovely on a home-made pizza. The whey has all sorts of uses. You can look it up online. Apparently you can bring it to the boil and make ricotta cheese. Ricotta means recooked. I’ve used it in my porridge and it’s really tasty. It gives the porridge a lovely tangy flavour. 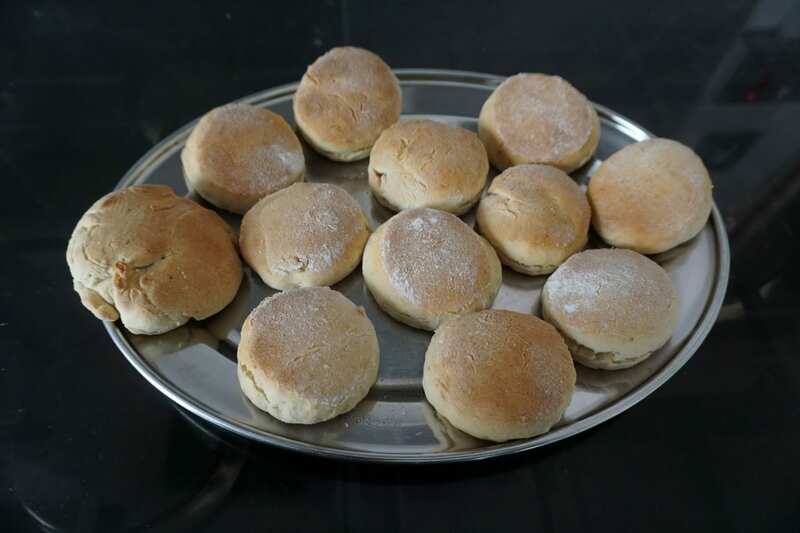 You can also use it instead of buttermilk, which I did when I made scones. This comes from an American cookery book. If you substituted some of the ingredients, it’s suitable for Vegans. It has no eggs in it. Preheat the oven to 220C. Grease and flour a baking tray. Place all the ingredients into a food processor and blitz. If you’re doing it by hand, leave out the whey until you’ve mixed the other ingredients to a breadcrumb consistency. If the mixture is too sticky to handle, add some more flour. 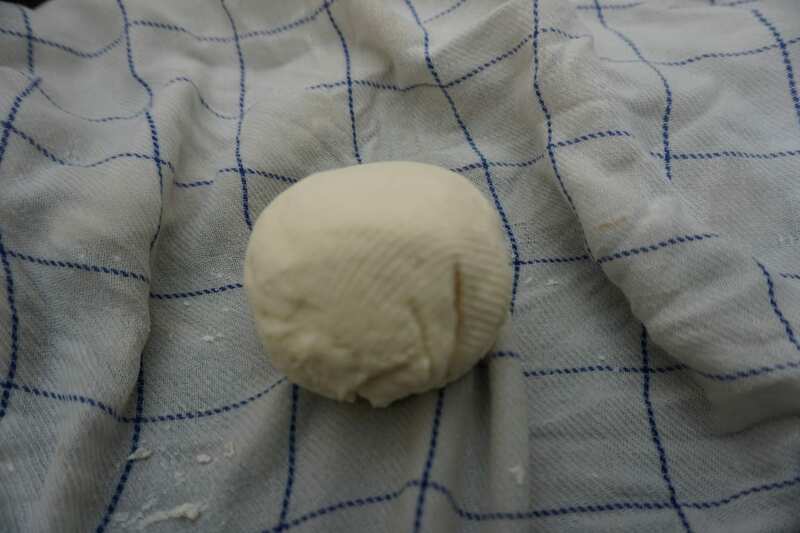 Roll out the dough on a floured surface to about 1cm/1/2inch thick. Cut circles with a cutter. 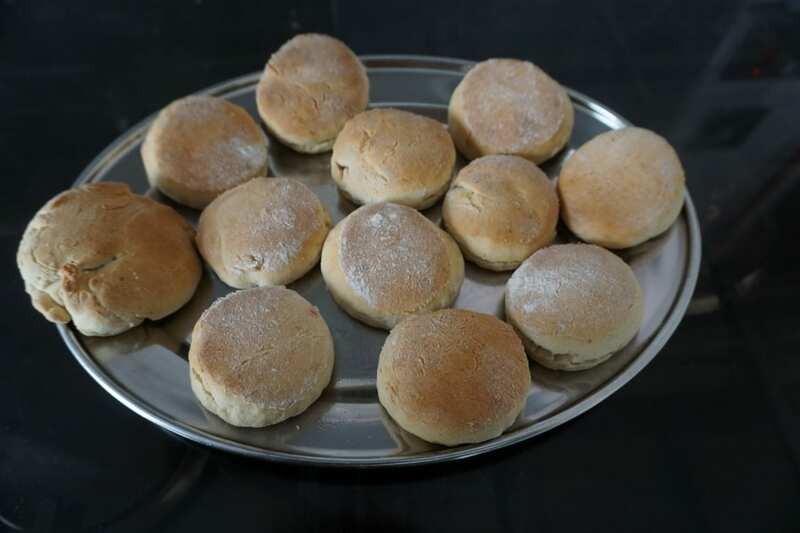 Force the remaining dough into the cutter and you should get 12 scones. Place on the tray and bake for approx. 15 minutes. Leave them a bit longer if necessary. I served one with butter and slices of my home-made cheese on top. I’ve read that whey instead of water makes lovely bread. It also adds a nice flavour if you cook potatoes or rice in it. If you find other uses for it, or more home-made cheese recipes, please let us know. Make Your Own Cheese; It’s Easier than You Think!